Why migrants are on hunger strike Jump to media player Nearly 20 migrants on the Greek island of Chios are taking part in a hunger strike. 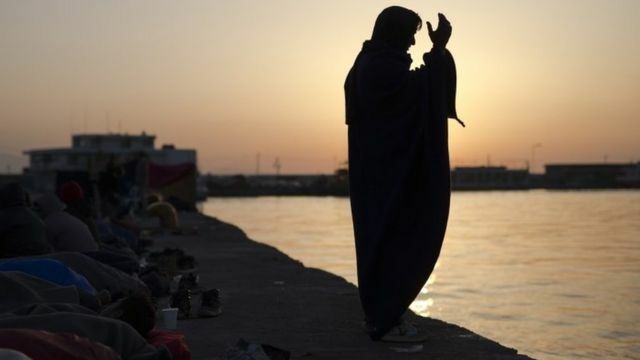 Thousands of migrants rescued from Med Jump to media player In the past few days, nearly 6,000 migrants trying to reach Europe have been rescued from flimsy craft in the Mediterranean. Migrants moved from Idomeni camp Jump to media player The authorities in Greece begin to evacuate the country's largest makeshift refugee camp. Idomeni camp 'taking toll' on migrants Jump to media player Nearly 10,000 migrants and refugees are still stranded in Idomeni in Greece following the closure of the Balkan route to Europe earlier this year. Refugees set up 'TV station' Jump to media player A group of refugees at Greece's Idomeni camp decides to change the way the migrant story is portrayed. Women-friendly space at Lesbos camp Jump to media player ActionAid's Nadia Krayem helps run a women's centre at the Kara Tepe camp on Lesbos, Greece. Nearly 20 migrants on the Greek island of Chios are taking part in a hunger strike. They say they are frustrated with their inability to move into Europe as well as poor living conditions in the refugee camps. Two Afghans were taken to hospital on Thursday after they tried to kill themselves.